We have solutions for your acne issues! If acne makes you feel like hiding away from the world, you’re not alone. People of all ages get acne, it’s not just an adolescent problem. Breaking out in pimples, whiteheads, blackheads, cysts and nodules is an upsetting condition at any age, but it doesn’t have to be a way of life. Most of the acne risk factors are related to genetics and hormonal changes that are happening on the inside– not just the outside of your skin. Acne pimples form when hair follicles get plugged with dead skin cells and oils. This plug then gets infected with bacteria, and swelling and redness occur. Usually, if you’ve had one ‘break out’ episode, you’ll experience it again. The good news is that acne is a treatable skin condition, and getting the right treatment is the best way to avoid future outbreaks and prevent acne scars. Dr. Marcia Hartt Medical Aesthetics offers expert acne care and effective options to treat your acne. These can include topical medications and medical grade skin care, SilkPeel Dermalinfusion Microdermabrasion, chemical peels, medical facials and laser treatments. Don’t let acne keep you from living your best life. Book your free skin analysis today. 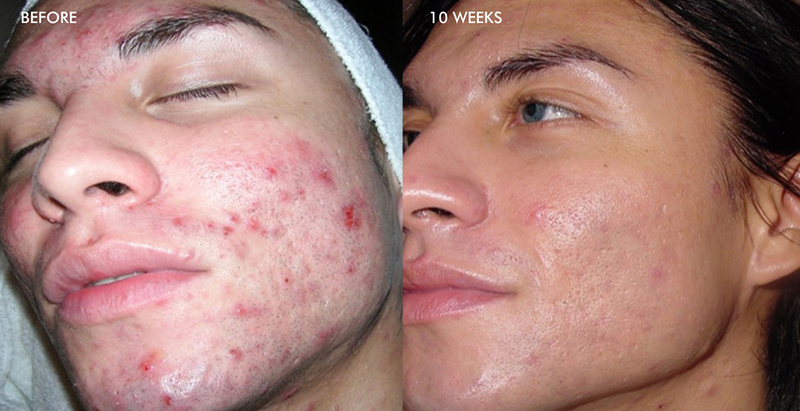 Often after the acne lesions have healed, you can be left with scars, either patches of discoloration or depressions. Acne can feel like a life sentence of skin concerns. Don’t despair, we can help. 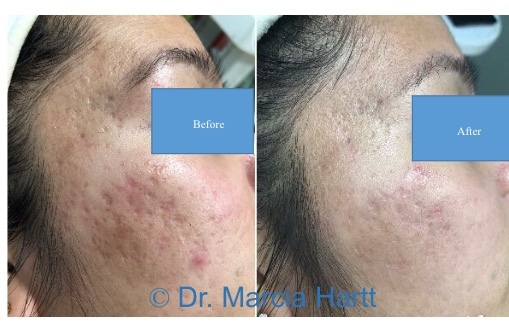 Dr. Marcia Hartt Medical Aesthetics uses the latest technology to reduce the appearance of acne scars so you can enjoy the freedom and confidence of having beautiful clear skin. Different kinds of acne scars do not all respond to the same treatment. Pigmented scars are most often treated with Intense Pulsed Light Therapy. Pulsed light technology targets and applies light to the discolored areas, which coagulates the blood vessel and breaks the pigmented lesion into tiny particles; these then disappear or rise to the surface of the skin as scabs, which are naturally exfoliated within one to two weeks. Other modalities can also treat pigmented scars, such as medical grade skin care, SilkPeel Dermalinfusion Microdermabrasion, chemical peels, medical facials, InfraRed (IR) Skin Tightening Laser, and Erbium Fractional Laser treatments. Indented or depressed acne scars affect the texture of your skin and are harder to treat. Deep indented scars are best treated with dermal fillers. Shallow depressions can be treated with Erbium Fractional Laser treatments, subcision or aggressive microneedling. Each of these treatments helps to build new collagen in the skin, which improves the texture and gives the skin a smoother surface. Book your free skin analysis today and find out what your options are for leaving those acne scars behind.